Chris Tuck has kindly provided a write up of the game he and Toby Whitty played at February’s big game day. 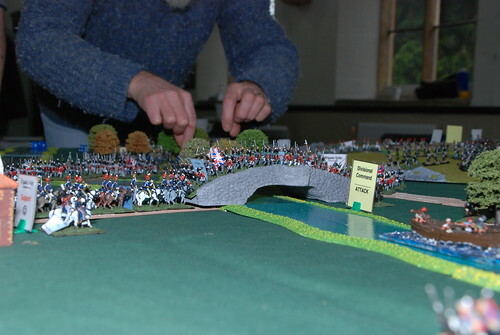 Comprising the latest action in the military ‘cake and arse party’ that are the Wars of the Gelderland Succession, the assault on Fort Gertrude pits a combined force of attackers from the Kingdom of Gelderland and the Palatinate of Saukopf-Bachscuttel against the defending troops of Imperial Fenwick. February saw the club return to Gettysburg for the afternoon of day one – Rodes’ Division attack. A selection of photos of the game by myself and Jerry can be found on Flickr. March Big Game: All at sea again! The main game for 4 March will be another of my soggy naval encounters, this time set during the Anglo-Dutch contretemps during the 17th century. As Pete said on Saturday last, we will be limited a little for space as the main hall will be in alternative use, so it would be helpful for me to gauge numbers who want to (or will!) play. Each player will control a squadron of ships (3-5), or so the plan is currently. The game will be using rules from Rod Langton, “Tiller and Whipstaff” which are reputed to be quick play………….but I will see about that when I playtest them! Can you reply ASAP so I can get planning. If you are interested in participating, please let Pete know as soon as possible. Author NeilPosted on February 7, 2017 November 12, 2017 Leave a comment on March Big Game: All at sea again! 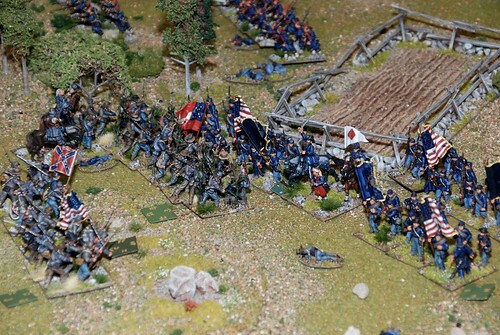 February Big Game: Gettysburg – sometime on the first day? The Army needs good men! It’s a Man’s life in the American Civil War Army! Join the Army today & become an Officer really quick! Apply to Gettysburg Quartermaster’s Office at Union HQ/ CSA HQ & be the heroic leader that stirring tales are written about! Join up today to lead Johnny Reb or Billy Yank to Victory! If you are interested in participating, or if ACW isn’t your thing and you’d like to offer something else, please let Pete know. Author NeilPosted on January 18, 2017 November 11, 2017 Leave a comment on February Big Game: Gettysburg – sometime on the first day? Our first big game day of 2017 saw three different games being played. 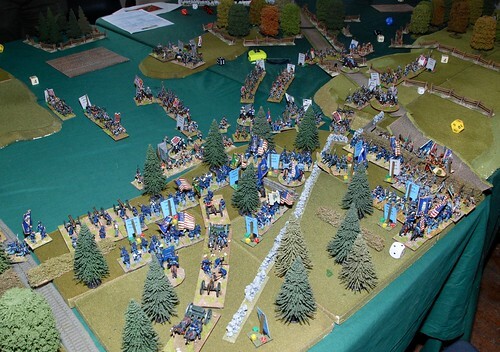 The main game was a 15mm Napoleonic battle using General Brigade de luxe rules recreating Vittoria 1813, Assault on the hill of Arinez. A selection of photos of the game can be found on Flickr. 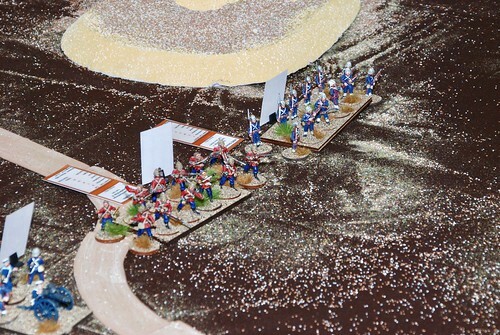 Just to confirm the January game I’m running will be 15mm (well 18mm actually) Napoleonic – General Brigade de luxe rules (ie Dave’s 3rd edition not that he ever calls it that!). Vittoria 1813, Assault on the hill of Arinez. We miss New Year’s Day this year as the first Saturday is the 7th. Probably means there will be less left over Christmas fare that will need consuming. As always, there is room for other games if Napoleonic warfare isn’t your cup of tea, so feel free to offer something up. And there are figures for Saga and The Men Who Would Be Kings available to make use of, just let us know if you’d like them got out. Photos: December Big Game: Medic, Medic! A small selection from December’s big game of Medic, Medic! can be found on Flickr. 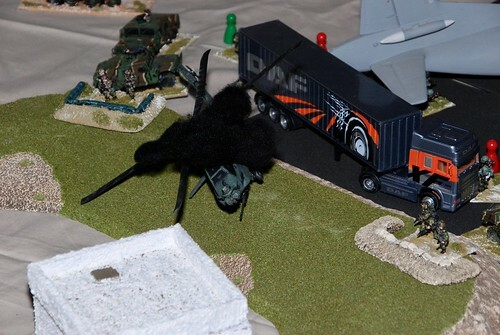 Thanks to Pete for putting the scenario together and for everyone who participated. I believe every force commander claimed their objectives had been achieved, even the Iranian Revolutionary Guard who were thwarted in their attempt to secure some much needed Russian equipment! And not once did any of the UN forces cry out “Medic, Medic!”, even when the US cobra was downed. Author NeilPosted on December 4, 2016 November 11, 2017 Leave a comment on Photos: December Big Game: Medic, Medic! Sunday November 27, 2016 saw myself, Pete, Richard and Steve head to Lincombe Barn Folk House, Downend, Bristol for Reveille 2016 to put on a Zulu Wars demostration game using the Osprey Games rules, The Men Who Would Be Kings. We managed to play three games of the scenario “Intombe River: The Rematch”, though due to what was later described as a “times table error”, the fist couple of games resulted in the complete massacre of the Zulu forces by the British, with the loss of almost no casualties! (A total of about five across the two games). Once a rebalancing of the forces was undertaken the third and final game proved to be a much closer affair, though when time was called the British did once again have the upper hand. Open ground really does make things tough for the Zulus to assault British Infantry! All in all we had a great day, seemed to generate much interest both in the game and the club and have another game to add to the list of offerings when a particular month’s main game doesn’t appeal. A selection of photos from the game can be found on Flickr. December Big Game: Medic, Medic! December sees the club return to a game that hasn’t made an appearance for quite some time: Medic, Medic! Developed from a Mike Slack original idea by Pete Connew of the Abbeywood Irregulars. Games are set in a fictional 1990s Turkmenistan with players taking on the roles of various United Nations Forces as well as local forces. From Pete’s description of past games, it seems interaction between the various UN force commanders can play as much a part as boots on the ground (or figures on the tables). If you are interested in participating, please let Pete know by December 1, so he can balance the scenario accordingly. Author NeilPosted on November 17, 2016 November 12, 2017 Leave a comment on December Big Game: Medic, Medic! 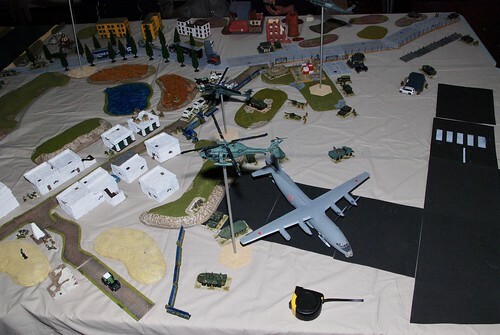 A small selection from November’s big game of Mission Command can be found on Flickr. Thanks to Alan for making the trip down to put the game on and for everyone who participated. It was a close run thing with neither side having really gained the upper hand by the time we decided to draw things to a close. A day well spent.